Kennel cough is a contagious condition that causes dogs to have a nasty hacking cough. While it is commonly caught at a kennel or other places where dogs are housed together (such as a shelter), it is an airborne disease that dogs can get anywhere. You may have heard of kennel cough being referred to as Infectious Tracheobronchitis. However, this is now considered old terminology. The new term for Kennel Cough is CIRD - Canine Infectious Respiratory Disease. This article describes what kennel cough is, how it is diagnosed, and how it is treated. We also will discuss the vaccines used to prevent kennel cough. How does a dog catch kennel cough? Video examples of dogs with kennel cough. How to know if your dog should see the vet. How is kennel cough diagnosed? How long is a dog with kennel cough contagious? Information about vaccinating for kennel cough. Which is better, intranasal or injectable vaccine? We used to think that kennel cough was mostly caused by a bacteria called Bordetella. The truth is that there are a number of viruses and bacteria that can contribute to kennel cough. This is why it is now recommended that we call kennel cough CIRD which stands for Canine Infectious Respiratory Disease. Sometimes, a virus will be the initial cause of the cough and then bacteria will come in and take advantage of the damaged respiratory tract. Other times, bacteria will initially infect the dog and then a virus will come along and do more damage. Dogs with viral and bacterial infections can sometimes be very sick. As mentioned above, the initial culprit in kennel cough (also known as CIRD) is either a virus (most commonly) or a bacterium. When a dog with CIRD coughs, he expels viral or bacterial particles into the air. When another dog breathes in these particles then they stick to the cells inside the nose and upper respiratory tract and start to replicate. The incubation period for CIRD is usually 4-10 days which means that 4-10 days after getting exposed to kennel cough is when a dog will start to get sick. In some cases though, if the initial virus was influenza virus the dog can get sick even sooner than 4 days after exposure. 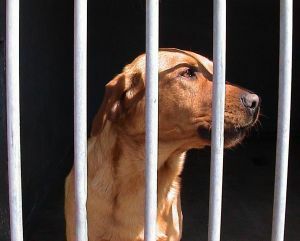 If a dog in a shelter or kennel gets sick, then the condition can spread very quickly. This is because the dogs are usually housed very close to each other and sharing the same airspace. It also doesn't help if the dogs are stressed. A stressed immune system is less likely to fight off a virus. Most dogs with CIRD will have a loud, harsh cough. The cough often sounds like he has something stuck in his throat. In fact, I often have a hard time convincing my clients that there is nothing stuck in their dog's throat! Some dogs will cough so much that they bring up white phlegm. I have had many dogs present to me for what the owner thought was vomiting, but actually the dog had extreme coughing fits. The cough can happen a few times a day, or it can happen several times a minute. Many of my clients have noted that the coughing is much worse at night time. Most dogs with CIRD will cough for under a week. But, for some dogs it can last longer. If there is damage to the respiratory tract some dogs can even have a mild cough for several months after being infected. How to know if your dog should see the vet? Green Nasal Discharge - This means that there is likely a bacterial component and your dog may need antibiotics. Lethargy - I'm not too worried if he is a bit quieter than usual on the first day of coughing, but if he is getting more and more lethargic then this could be because of a fever. Coughing that is very severe - If the coughing is keeping you awake at night, or if you just feel that he is coughing all day long, then see the vet. They can prescribe a cough suppressant (more on this later in the article). Trouble breathing - If you think the dog is breathing faster than normal, or struggling at all to breathe then this could be something other than kennel cough. Any time an animal has difficulty breathing a vet visit is recommended right away. Listen to your gut - If you just feel that something is wrong, then follow that gut feeling and see the vet. It is better to be safe than sorry! The veterinarian will feel the trachea to see if this makes the dog cough. Most dogs with kennel cough will have an irritated trachea. In most cases no lab tests or xrays are done to diagnose kennel cough. The first thing the vet will do will discuss your dog's history. How long has the cough been present? If this is a chronic thing that comes and goes then this is not likely to be kennel cough. But, if it's a sudden hacking cough then kennel cough is more likely. 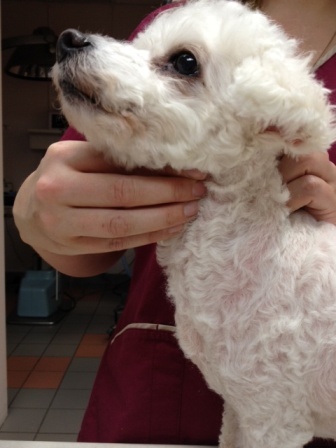 The vet will do a physical exam and feel the dog's trachea (windpipe). Most dogs with kennel cough will start coughing if pressure is put on their trachea, but not all do. If your dog is very sick, not eating or if the cough has been chronic then the vet may decide to take some chest xrays and do some lab tests to see if there is evidence of pneumonia or another condition that could cause coughing such as a heart problem. There are lab tests that can be done to determine if one or more of the above mentioned viruses or bacteria are present. However, these tests are quite expensive and in some cases it can take days or weeks to get the results back. So generally, these tests are not done. For mild cases of kennel cough, the best treatment is to do nothing! For many dogs the symptoms will get better within a few days even with no medication. I will often prescribe a cough suppressant called Hycodan (hydrocodone) to help dogs who are very uncomfortable with their cough or coughing all day and night long. Hycodan is a narcotic medication and some dogs who take it will get a little bit sedated while they are on it. Other drugs that your vet may prescribe to help with a cough are codeine, butorphanol or dextromethorphan. Important note: Do not use over the counter cough suppressants that are meant for humans. While some of these do contain dextromethorphan, they usually contain a number of other medications as well which may not be safe for your dog. Only use these medications under the guidance of your veterinarian. If your dog has a green discharge from the nose, or is really sick with a fever and possible secondary pneumonia, your vet may prescribe antibiotics. If your dog is really having difficulty breathing, the vet may prescribe a medication called a bronchodilator which will help to open up his airways. How long is a dog with kennel cough contagious to other dogs? A dog with kennel cough is contagious to other dogs for 7-14 days. The most contagious time is the first 7 days. Most vets will recommend staying away from other dogs for two weeks. The virus particles are spread via the air. They can also be spread in saliva (i.e. on toys, in food dishes, etc.). It is not possible to always say how long a dog is contagious for because we often don't know which viral agent is responsible for the cough. Most dogs are very contagious for a week and then mildly contagious after that. We believe that if the bacteria Bordetella is involved, then the dogs can be shedding the organism for months after they are infected. I usually recommend that dogs with kennel cough stay away from other dogs for a period of two weeks. I'll recommend a longer period of isolation if the dog is very sick or coughing for longer than a week. If your dog is going to be going to a boarding kennel, almost every reputable kennel will require that they are up to date on their kennel cough vaccine. For most areas, a vaccination every 12 months is sufficient. However, in some areas, every 6 month vaccination is required. The kennel cough vaccines are all supposed to last for a year, but for some patients we believe that 6-10 months of protection may be what they actually get. There are two types of vaccinations for kennel cough - intranasal and injectable. Both vaccines are acceptable as proof of kennel cough vaccination (i.e. when a boarding kennel wants to see proof). If your dog has never had injectable kennel cough vaccine before, then a booster needs to be done a month later before the vaccine is effective. Both vaccines are reported to last a year. However, in some areas, if a lot of kennel cough cases are being seen, sometimes vaccination every 6 months is recommended. 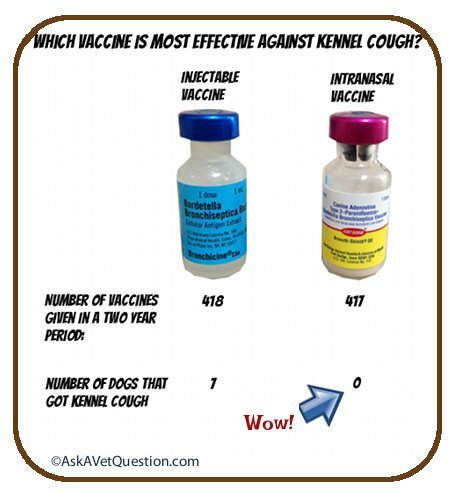 Which is better for kennel cough - intranasal or injectable vaccine? What I found was that we had 31 cases of suspected kennel cough in a two year period. 7 of those cases had been properly vaccinated with an injectable vaccine. None of those cases had had an intranasal vaccine. Why is the intranasal vaccine working better? I believe that the intranasal vaccine works better in our area because it protects against some of the viruses that can contribute to kennel cough. As mentioned above, we now call kennel cough CIRD (Canine Infectious Respiratory Disease) because there are so many contributing factors. The injectable vaccine protects against the bacteria Bordetella, but has no protection against viruses. The intranasal vaccine that we use protects against parainfluenza and adenovirus as well. I was recently speaking with a representative from Pfizer who makes our injectable vaccine. The next time we have an animal get kennel cough despite being vaccinated with a subcutaneous vaccine, Pfizer is going to pay for us to do some laboratory tests to determine exactly what the cause of the sickness was. I'll keep you updated and report back when that happens. Reactions to the intranasal vaccine. It should also be noted that occasionally a dog will have a reaction to the intranasal vaccine. A very small percentage of dogs can actually come down with kennel cough within a few days of receiving the "squirt up the nose" vaccination. To put things in perspective, I have seen this happen in my patients twice in the last two years and I have given 417 intranasal vaccines in this time period. This translates to a risk of 0.5%. In most cases, the reaction is very mild causing a cough that lasts a few days. I've attempted to write a very complete article with everything you'd need to know about kennel cough. If I've missed anything or you have more information to add, leave a comment below! Keep in mind that I can't answer specific questions about your pet though. For that feature, you can click here to ask a vet a question. Dr. Marie was quick to respond and thorough in suggesting treatment for my cat. I am so thankful- I have been so worried about my cat. Now I have additional options to discuss with my vet. The service was incredibly fast and the vet's suggestions were right on target. This was incredibly helpful given that none of the vets in my area, mine now included, will take off hours calls now. While it is more commong for dogs to get kennel cough in a boarding facility, they do not have to be boarding to get it. I've found some Youtube videos of dogs with coughs that sound like kennel cough to give you an idea of what the cough sounds like. Below these videos are ones of dogs who don't have kennel cough. Important note: Sometimes the type of cough with each particular disease can vary. Please don't use these videos to diagnose your dog. I have simply included them for interests' sake.